Blue-green algae, also called cyanobacteria, are a type of microscopic bacteria that occur naturally in freshwater lakes, bays, ponds, rivers and streams usually beginning in late summer or early fall. Blue-green algae are not normally visible in the water, but as the algae multiply they can quickly increase to form a large mass or scum called a ‘bloom’. 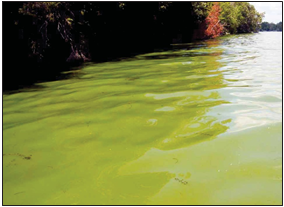 Algal blooms usually occur in the hot summer months and early fall. They tend to occur repeatedly in the same water bodies. Blue-green algae thrive in areas where the water is shallow, slow moving and warm, but they may be present in deeper, cooler water. Some, but not all, blue-green algae blooms are considered harmful as they may produce toxins that can be harmful to the health of people and pets. There’s no way to tell by looking at a bloom whether it contains toxins or not. Dense blue-green algae blooms may make the water look like bluish-green, like green pea soup or turquoise paint. When the blooms are very dense, they may form solid-looking clumps. Fresh blooms often smell like newly mown grass; older blooms may smell like rotting garbage. If swimming near or in the harmful blue-green algal bloom immediately take a shower. Consult a healthcare provider if symptoms such as skin, eye or throat irritation, allergic reactions or breathing difficulties; nausea, vomiting or diarrhea develop. Public Health (toll-free) at 1-800-265-7293 ext. 4753 or by email at PHI.Intake@wdgpublichealth.ca. Some blue-green algae produce toxins that can pose a health risk to people and animals. Please note that infants and young children (under age 6) are most at risk of developing health problems (e.g., liver damage) from exposure to blue-green algae.